Globally about 600 cases are reported a year. In 2017 the countries with the most cases include the Democratic Republic of the Congo, Madagascar and Peru. In the United States infections occasionally occur in rural areas and the bacteria is believed to circulate among rodents. It has historically occurred in large outbreaks, with the best known being the Black Death in the 14th century, which resulted in greater than 50 million dead. Swollen inguinal lymph glands on a person infected with the bubonic plague. The swollen lymph glands are termed buboes from the Greek word for groin, swollen gland: bubo. Lymphatics ultimately drain into the bloodstream, so the plague bacteria may enter the blood and travel to almost any part of the body. In septicemic plague, bacterial endotoxins cause disseminated intravascular coagulation (DIC), causing tiny clots throughout the body and possibly ischemic necrosis (tissue death due to lack of circulation/perfusion to that tissue) from the clots. DIC results in depletion of the body's clotting resources, so that it can no longer control bleeding. Consequently, there is bleeding into the skin and other organs, which can cause red and/or black patchy rash and hemoptysis/hematemesis (coughing up/ vomiting of blood). There are bumps on the skin that look somewhat like insect bites; these are usually red, and sometimes white in the center. Untreated, septicemic plague is usually fatal. Early treatment with antibiotics reduces the mortality rate to between 4 and 15 percent. People who die from this form of plague often die on the same day symptoms first appear. The Oriental rat flea (Xenopsylla cheopsis) engorged with blood after a blood meal. This species of flea is the primary vector for the transmission of Yersinia pestis, the organism responsible for bubonic plague in most plague epidemics in Asia, Africa and South America. Both male and female fleas feed on blood and can transmit the infection. A child bitten by a flea infected with the bacterium Yersinia pestis. 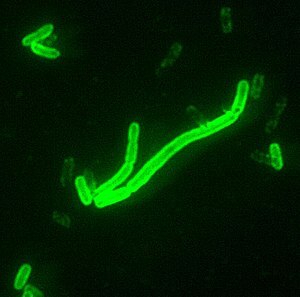 Y. pestis, a member of the family Enterobacteriaceae, has caused the bite to become ulcerated. 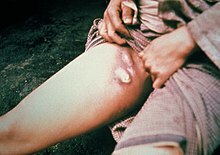 Since human plague is rare in most parts of the world, routine vaccination is not needed other than for those at particularly high risk of exposure, nor for people living in areas with enzootic plague, meaning it occurs at regular, predictable rates in populations and specific areas, such as the western United States. It is not even indicated for most travellers to countries with known recent reported cases, particularly if their travel is limited to urban areas with modern hotels. The CDC thus only recommends vaccination for: (1) all laboratory and field personnel who are working with Y. pestis organisms resistant to antimicrobials: (2) people engaged in aerosol experiments with Y. pestis; and (3) people engaged in field operations in areas with enzootic plague where preventing exposure is not possible (such as some disaster areas). Globally about 600 cases are reported a year. In 2017 the countries with the most cases include the Democratic Republic of the Congo, Madagascar and Peru. It has historically occurred in large outbreaks, with the best known being the Black Death in the 14th century which resulted in greater than 50 million dead. ^ a b c d e f "Symptoms Plague". CDC. September 2015. Retrieved 8 November 2017. ^ a b c d e f g h i j k l m n o p q r "Plague". World Health Organization. October 2017. Retrieved 8 November 2017. ^ a b "Resources for Clinicians Plague". CDC. October 2015. Retrieved 8 November 2017. ^ a b "FAQ Plague". CDC. September 2015. Retrieved 8 November 2017. ^ "Transmission Plague". CDC. September 2015. Retrieved 8 November 2017. ^ Brown, SD; Montie, TC (1977). "Beta-adrenergic blocking activity of Yersinia pestis murine toxin". Infection and Immunity. 18 (1): 85–93. PMC 421197. PMID 198377. ^ Sebbane, F; Jarret, C.O. ; Gardner, D; Long, D; Hinnebusch, B.J. (2006). "Role of Yersinia pestis plasminogen activator in the incidence of distinct septicemic and bubonic forms of flea-borne plague". Proc Natl Acad Sci U S A. 103 (14): 5526–5530. doi:10.1073/pnas.0509544103. PMC 1414629. PMID 16567636. ^ "Symptoms | Plague". Centers for Disease Control and Prevention. 14 September 2015. Retrieved 18 April 2017. ^ Sebbane, F; Gardner, D; Long, D; Gowen, B.B. ; Hinnebusch, B.J. (2005). "Kinetics of Disease Progression and Host Response in a Rat Model of Bubonic Plague". Am J Pathol. 166 (5): 1427–1439. doi:10.1016/S0002-9440(10)62360-7. PMC 1606397. PMID 15855643. ^ "Plague". Centers for Disease Control and Prevention. Retrieved 2014-08-05. ^ Wagle PM (1948). "Recent advances in the treatment of bubonic plague". Indian J Med Sci. 2: 489–94. ^ Meyer KF (1950). "Modern therapy of plague". J Am Med Assoc. 144 (12): 982–85. doi:10.1001/jama.1950.02920120006003. PMID 14774219. ^ Datt Gupta AK (1948). "A short note on plague cases treated at Campbell Hospital". Ind Med Gaz. 83: 150–51. ^ Ryan, K. J.; Ray, C. G., eds. (2004). Sherris Medical Microbiology: An Introduction to Infectious Diseases (4th ed.). New York: McGraw-Hill. ISBN 978-0-8385-8529-0. ^ Hoffman SL (1980). "Plague in the United States: the "Black Death" is still alive". Annals of Emergency Medicine. 9 (6): 319–22. doi:10.1016/S0196-0644(80)80068-0. PMID 7386958. ^ Yersin, Alexandre (1894). "La peste bubonique à Hong-Kong". Annales de l'Institut Pasteur. 8: 662–67. ^ "Plague Vaccine". CDC. June 11, 1982. Retrieved Apr 30, 2015. ^ Mwengee W; Butler, Thomas; Mgema, Samuel; Mhina, George; Almasi, Yusuf; Bradley, Charles; Formanik, James B.; Rochester, C. George (2006). "Treatment of Plague with Genamicin or Doxycycline in a Randomized Clinical Trial in Tanzania". Clin Infect Dis. 42 (5): 614–21. doi:10.1086/500137. PMID 16447105. ^ Drug-resistant plague a 'major threat', say scientists, SciDev.Net. ^ "Plague – Madagascar". World Health Organisation. 21 November 2014. Retrieved 26 November 2014. ^ "WHO scales up response to plague in Madagascar". World Health Organization (WHO). 1 October 2017. Retrieved 5 October 2017. ^ Wheelis M. (2002). "Biological warfare at the 1346 siege of Caffa". Emerg Infect Dis. 8 (9): 971–75. doi:10.3201/eid0809.010536. PMC 2732530. PMID 12194776. ^ Tamparo, Carol; Lewis, Marcia (2011). Diseases of the Human Body. Philadelphia, PA: F.A. Davis Company. p. 70. ISBN 9780803625051.